If you don't see your favorite venue/performer and would like this app, please contact your venue administrators/performer. Ask them to participate in this free service for your community. We perform at multiple venues. Can this app provide that distinction? Yes, the location of the show will be listed when the "Info" button is tapped on the specific event. No address is given for the performer, because the venue changes. How quickly is the app updated after we provide new information via spreadsheet? Now that we've delivered the web portal, you may update the information directly, and the changes will be immediate. You will need to close and re-open the app to see the changes. How often can we update our information on the app? You may update the information as often as you'd like. Is any personal information taken from a patron who downloads this app? We do not collect any data from the user. We do, however, deliver Google Ads. Google does collect data about users and their browsing history. This behavior is typical for most apps and websites that deliver Google Ads. Who lists it in the App Store? Are we responsible for tech support or your team? We will list the app in the app stores with our contact info for technical issues and questions. Following the build is there a subscription fee to continue using it? There is no fee whatsoever for you or your users. Our compensation comes from ad revenue inside the app. Does/Can it link to my ticketing site? We can add a link to your ticketing site. I recommend adding the direct link for each event in the web portal so that the user is taken directly to the page for the event in which they are interested. 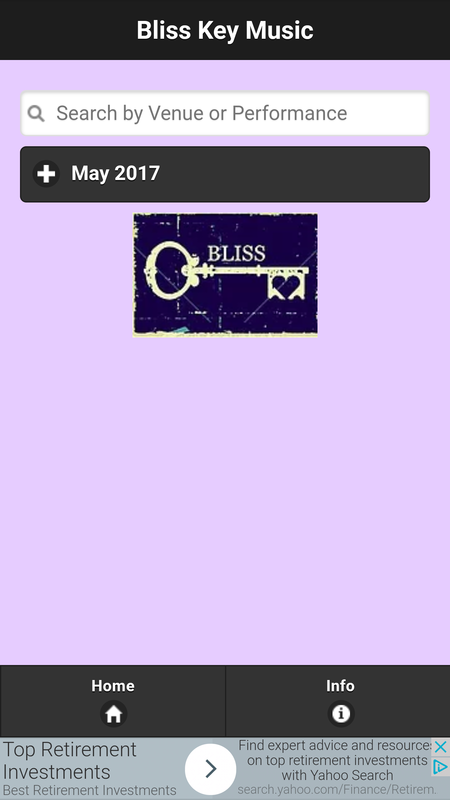 Are there metrics associated with the app that we would be able to view: number of downloads, number of people who add to their calendar, number of people who used the ticket button, etc.? a. Number of downloads for certain platforms can be added to the web portal upon. This can be deceiving because many of the app's installations are done by users in foreign countries who may never be in your area. b. We can only track the number of times the Calendar button was clicked. 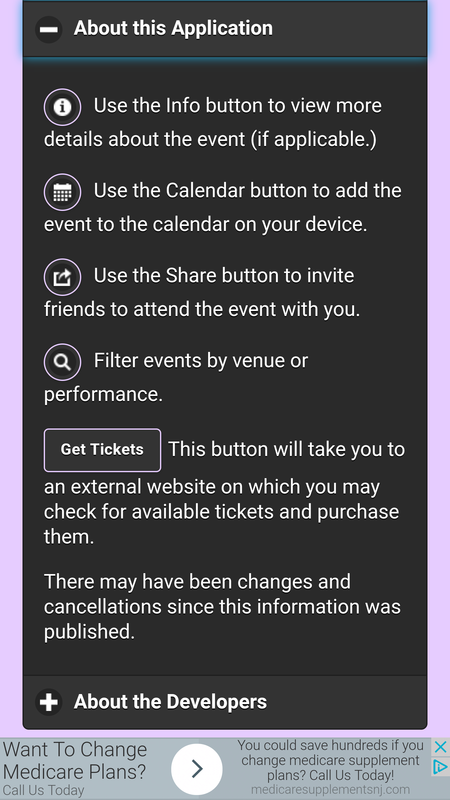 Users may cancel the process before adding an event to the calendar, but that is done outside of our app. You can also use a link-shortening service (https://goo.gl) to provide unique urls for app users that can be tracked. How do you guys benefit from this arrangement if the app is free for me? It is our intention to drive traffic to your website to increase ticket sales. To this end, we will be promoting the app and your shows with our social media accounts. In the process, we will deliver ads inside the app to generate small amounts of revenue and we will use the app to showcase our work to other potential clients. Free live music schedule apps. 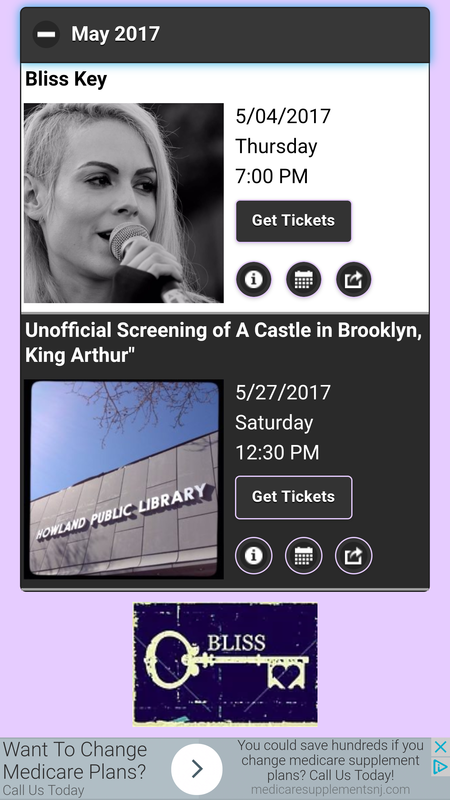 We developed a platform to easily provide free apps that allow the community to view live music events and add them to the calendar on their device. The basic package is free for venues/performers and fans. All apps use the black and white color scheme unless specifically requested. A third color can be added to the background. Add the desired color in the specified location on the registration web page. For a perfect match to your website, please include the hex code (#000000). Sign up for a user name and password. Sign and return the App Consent Form. Your user name and password will be emailed to you. Log in with your new user name and password. Enter your events on the web page. If you have a small number of events, we can help to compile this data for you. Search for venues/performers after choosing your device's operating system. © TechingCrew LLC. All rights reserved.